Everyone knows that blogging, with relevant and timely posts, is good for your SEO. It drives traffic to your site. In something like the way you know eating green vegetables make you healthy - it's enough to do it and trust that it works, because it does. However, your blog is also an excellent way of demonstrating your expertise and specialist knowledge. If you create regular posts where you talk with authority then you'll start to become known as an authoritative voice on that subject. For example - and here I get to the point of the Starsky and Hutch photo - an interesting thing happened to me the other day. When I'm not writing for other people, I'm tapping away having fun and creating posts for my own family blog. 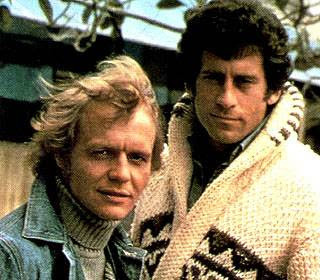 A couple of months ago, I'd written a post about who I had my first crush - Starsky was one of them, if you must know. Then I forgot about it. Only a week or so ago I got an email from a producer of the Mark Forrest BBC radio show. They were talking about teenage infatuation with celebrities and would I mind talking about mine. I didn't mind and that evening Mark interviewed me live on his show. Of course, fond memories of an American cop show isn't going to earn me any additional business directly, however, several people said they'd heard the show and it prompted them to visit my blog and see what else I'd written. The point is if you use your blog to discuss the things you want to get know for being an expert on then, before long, people looking for that expertise will find you. All you need to do is talk about what you're passionate about (in a grammatically correct and well tagged post) and the readers will come.